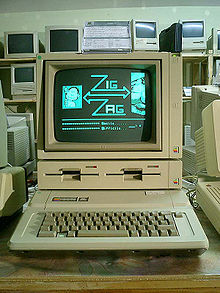 The Apple II series was a popular video game platform during the early home computer era. Despite being outperformed by later systems, it remained popular until the early 1990s. In the early days of video games (from the early 1970s to mid-1980s), a game programmer also took on the job of a designer and artist. This was generally because the abilities of early computers were so limited that having specialized personnel for each function was unnecessary. Game concepts were generally light and games were only meant to be played for a few minutes at a time, but more importantly, art content and variations in gameplay were constrained by computers' limited power. Later, as specialized arcade hardware and home systems became more powerful, game developers could develop deeper storylines and could include such features as high-resolution and full color graphics, physics, advanced artificial intelligence and digital sound. Technology has advanced to such a great degree that contemporary games usually boast 3D graphics and full motion video using assets developed by professional graphic artists. Nowadays, the derogatory term "programmer art" has come to imply the kind of bright colors and blocky design that were typical of early video games. A contemporary video game may include advanced physics, artificial intelligence, 3D graphics, digitised sound, an original musical score, complex strategy and may use several input devices (such as mice, keyboards, gamepads and joysticks) and may be playable against other people via the Internet or over a LAN. Each aspect of the game can consume all of one programmer's time and, in many cases, several programmers. Some programmers may specialize in one area of game programming, but many are familiar with several aspects. The number of programmers needed for each feature depends somewhat on programmers' skills, but mostly are dictated by the type of game being developed. A game's physics programmer is dedicated to developing the physics a game will employ. Typically, a game will only simulate a few aspects of real-world physics. For example, a space game may need simulated gravity, but would not have any need for simulating water viscosity. Since processing cycles are always at a premium, physics programmers may employ "shortcuts" that are computationally inexpensive, but look and act "good enough" for the game in question. In other cases, unrealistic physics are employed to allow easier gameplay or for dramatic effect. Sometimes, a specific subset of situations is specified and the physical outcome of such situations are stored in a record of some sort and are never computed at runtime at all. Historically, this title usually belonged to a programmer who developed specialized blitter algorithms and clever optimizations for 2D graphics. Today, however, it is almost exclusively applied to programmers who specialize in developing and modifying complex 3D graphic renderers. Some 2D graphics skills have just recently become useful again, though, for developing games for the new generation of cell phones and handheld game consoles. An AI programmer develops the logic of time to simulate intelligence in enemies and opponents. It has recently evolved into a specialized discipline, as these tasks used to be implemented by programmers who specialized in other areas. An AI programmer may program pathfinding, strategy and enemy tactic systems. This is one of the most challenging aspects of game programming and its sophistication is developing rapidly. Contemporary games dedicate approximately 10 to 20 percent of their programming staff to AI. Some games, such as strategy games like Civilization III or role-playing video games such as The Elder Scrolls IV: Oblivion, use AI heavily, while others, such as puzzle games, use it sparingly or not at all. Many game developers have created entire languages that can be used to program their own AI for games via scripts. These languages are typically less technical than the language used to implement the game, and will often be used by the game or level designers to implement the world of the game. Many studios also make their games' scripting available to players, and it is often used extensively by third party mod developers. Many games use advanced techniques such as 3D positional sound, making audio programming a non-trivial matter. With these games, one or two programmers may dedicate all their time to building and refining the game's sound engine, and sound programmers may be trained or have a formal background in digital signal processing. Scripting tools are often created or maintained by sound programmers for use by sound designers. These tools allow designers to associate sounds with characters, actions, objects and events while also assigning music or atmospheric sounds for game environments (levels or areas) and setting environmental variables such as reverberation. Though all programmers add to the content and experience that a game provides, a gameplay programmer focuses more on a game's strategy, implementation of the game's mechanics and logic, and the "feel" of a game. This is usually not a separate discipline, as what this programmer does usually differs from game to game, and they will inevitably be involved with more specialized areas of the game's development such as graphics or sound. The joystick was the primary input device for 1980s era games. Now game programmers must account for a wide range of input devices, but the joystick today is supported in relatively few games, though still dominant for flight simulators. The tools programmer can assist the development of a game by writing custom tools for it. Game development Tools are often contain features such as script compilation, importing or converting art assets, and level editing. While some tools used may be COTS products such as an IDE or a graphics editor, tools programmers create tools with specific functions tailored to a specific game which are not available in commercial products. For example, an adventure game developer might need an editor for branching story dialogs, and a sport game developer could use a proprietary editor to manage players and team stats. These tools are usually not available to the consumers who buy the game. Porting a game from one platform to another has always been an important activity for game developers. Some programmers specialize in this activity, converting code from one operating system to work on another. Sometimes, the programmer is responsible for making the application work not for just one operating system, but on a variety of devices, such as mobile phones. Often, however, "porting" can involve re-writing the entire game from scratch as proprietary languages, tools or hardware make converting source code a fruitless endeavour. The technology programmer is more likely to be found in larger development studios with specific departments dedicated solely to R&D. Unlike other members of the programming team, the technology programmer usually isn't tied to a specific project or type of development for an extended length of time, and they will typically report directly to a CTO or department head rather than a game producer. As the job title implies, this position is extremely demanding from a technical perspective and requires intimate knowledge of the target platform hardware. Tasks cover a broad range of subjects including the practical implementation of algorithms described in research papers, very low-level assembly optimization and the ability to solve challenging issues pertaining to memory requirements and caching issues during the latter stages of a project. There is considerable amount of cross-over between this position and some of the others, particularly the graphics programmer. In smaller teams, one or more programmers will often be described as 'Generalists' who will take on the various other roles as needed. Generalists are often engaged in the task of tracking down bugs and determining which subsystem expertise is required to fix them. Game programmers can specialize on one platform or another, such as the Wii U or Windows. So, in addition to specializing in one game programming discipline, a programmer may also specialize in development on a certain platform. Therefore, one game programmer's title might be "PlayStation 3 3D Graphics Programmer." Some disciplines, such as AI, are transferable to various platforms and needn't be tailored to one system or another. Also, general game development principles such as 3D graphics programming concepts, sound engineering and user interface design are naturally transferable between platforms. Notably, there are many game programmers with no formal education in the subject, having started out as hobbyists and doing a great deal of programming on their own, for fun, and eventually succeeding because of their aptitude and homegrown experience. However, most job solicitations for game programmers specify a bachelor's degree (in mathematics, physics, computer science, "or equivalent experience"). Increasingly, universities are starting to offer courses and degrees in game programming. Any such degrees have considerable overlap with computer science and software engineering degrees. Though sales of video games rival other forms of entertainment such as movies, the video game industry is extremely volatile. Game programmers are not insulated from this instability as their employers experience financial difficulty. Third-party developers, the most common type of video game developers, depend upon a steady influx of funds from the video game publisher. If a milestone or deadline is not met (or for a host of other reasons, like the game is cancelled), funds may become short and the developer may be forced to retrench employees or declare bankruptcy and go out of business. Game programmers who work for large publishers are somewhat insulated from these circumstances, but even the large game publishers can go out of business (as when Hasbro Interactive was sold to Infogrames and several projects were cancelled; or when The 3DO Company went bankrupt in 2003 and ceased all operations). Some game programmers' resumes consist of short stints lasting no more than a year as they are forced to leap from one doomed studio to another. This is why some prefer to consult and are therefore somewhat shielded from the effects of the fates of individual studios. Most commercial computer and video games are written primarily in C++, C, and some assembly language. Many games, especially those with complex interactive gameplay mechanics, tax hardware to its limit. As such, highly optimized code is required for these games to run at an acceptable frame rate. Because of this, compiled code is typically used for performance-critical components, such as visual rendering and physics calculations. Almost all PC games also use either the DirectX, OpenGL APIs or some wrapper library to interface with hardware devices. Various script languages, like Ruby, Lua and Python, are also used for the generation of content such as gameplay and especially AI. Scripts are generally parsed at load time (when the game or level is loaded into main memory) and then executed at runtime (via logic branches or other such mechanisms). They are generally not executed by an interpreter, which would result in much slower execution. Scripts tend to be used selectively, often for AI and high-level game logic. Some games are designed with high dependency on scripts and some scripts are compiled to binary format before game execution. In the optimization phase of development, some script functions will often be rewritten in a compiled language. As games have grown in size and complexity, middleware is becoming increasingly popular within the industry. Middleware provides greater and higher level functionality and larger feature sets than the standard lower level APIs such as DirectX and OpenGL, such as skeletal animation. In addition to providing more complex technologies, some middleware also makes reasonable attempts to be platform independent, making common conversions from, for example, Microsoft Windows to PS4 much easier. Essentially, middleware is aimed at cutting out as much of the redundancy in the development cycle as possible (for example, writing new animation systems for each game a studio produces), allowing programmers to focus on new content. Other tools are also essential to game developers: 2D and 3D packages (for example Blender, GIMP, Photoshop, Maya or 3D Studio Max) enable programmers to view and modify assets generated by artists or other production personnel. Source control systems keep source code safe, secure and optimize merging. IDEs with debuggers (such as Visual Studio) make writing code and tracking down bugs a less painful experience. This page is based on the Wikipedia article Video game programmer; it is used under the Creative Commons Attribution-ShareAlike 3.0 Unported License (CC-BY-SA). You may redistribute it, verbatim or modified, providing that you comply with the terms of the CC-BY-SA.